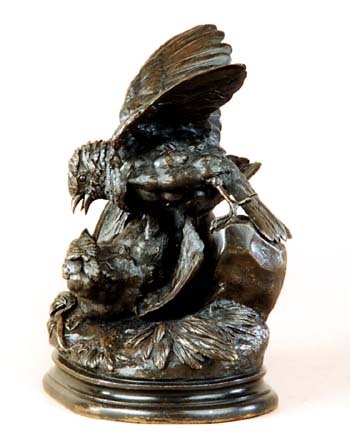 If there were ever a master at capturing birds in bronze it would have to be Jules Moigniez. He received his formal training from Paul Comolera who up until his puple's debut was hailed as the finest bird sculptor of all time. Moigniez soon claimed this honor and even to this day no other artist has approached the detail and accuracy in the fine feather details. This work Combat de deux Moineaux is a masterpiece not only for the detail of these two small antagonists or the intensity of the "battle" between them but the complexity of the model is amazing. One sparrow has been knocked to the ground, wings, legs, and tail flailing and the other swoops down upon his rival. You can almost hear the screams coming from both open beaks. 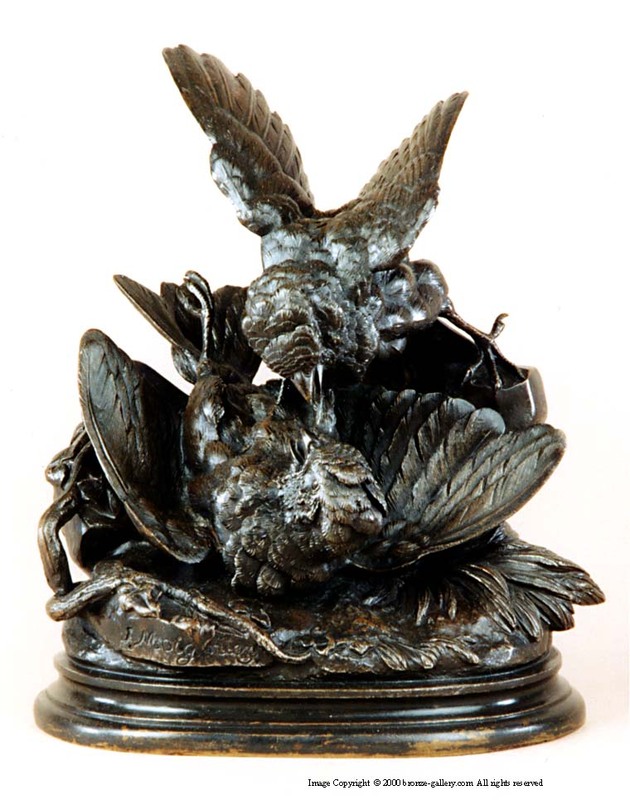 It is cast with such meticulous attention to detail and composition that you would almost believe the he cast two live birds instead of creating a work of art from metal. This bronze would have to rank as one of his most important bird sculptures. It is finished in a rich brown patina. It is interesting to note that Moigniez's teacher Paul Comolera also cast a model of this same subject around the time this sculpture was created.